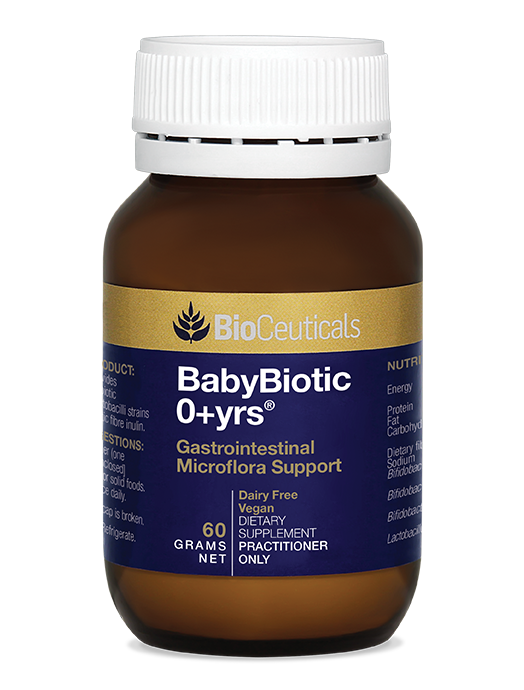 Give your baby a great start in life with BioCeuticals BabyBiotic 0+yrs® - the dairy-free probiotic bacteria for baby's digestive tract. 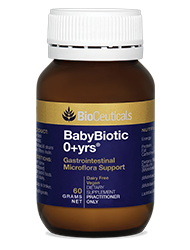 BabyBiotic 0+yrs® is a dairy-free probiotic powder specifically designed to nurture healthy gastrointestinal microflora in neonates, infants and children. 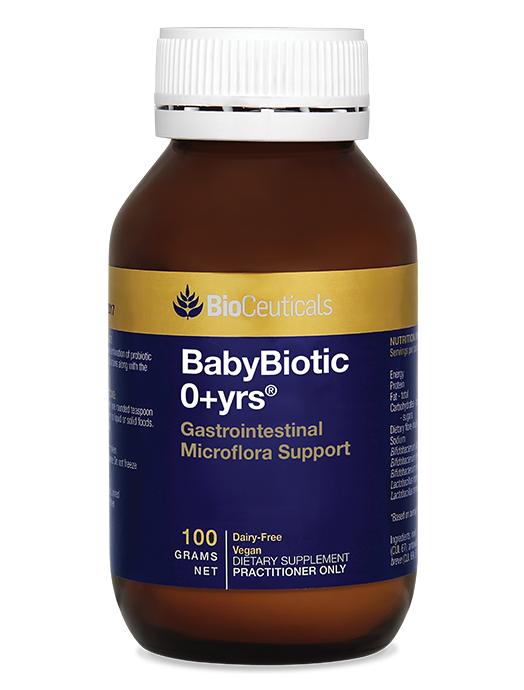 BabyBiotic 0+yrs combines multiple strains of probiotics including Bifidobacterium breve (M-16V), B. infantis (M63) and B. animalis ssp. lactis (CUL34) and more - some of the most common probiotic strains present in the gastrointestinal tract (GIT) of healthy breastfed newborns and infants. Provides probiotic strains commonly found in breastfed infants. 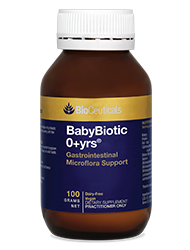 BabyBiotic 0+yrs® is a symbiotic formula; combining probiotic bifidobacteria and lactobacilli strains along with the prebiotic fibre inulin. Probiotics are live microorganisms which provide a health benefit when taken in adequate amounts. Inulin is classified as prebiotic, and is found in many fruits and vegetables. Ingredients: chicory root inulin, potato maltodextrin, microorganisms [B. breve (M-16V), B. longum (BB536), L. rhamnosus (GG), L. fermentum (CUL67), B. animalis ssp. lactis (CUL34), B. bifidum (CUL73), B. infantis (M63), B. bifidum (CUL20)], corn starch (non GMO), tapioca starch, corn maltodextrin (non GMO), calcium phosphate. From newborn: Add up to 1.5g of powder (one heaped scoop supplies 1.5g) to water, liquid or solid foods. Consume once or twice daily. - insert into child's cheek or between bottom lip and gum immediately before feeding. Alternatively, add to formula after heating for immediate feeding. Always read label. Use only as directed. BioCeuticals will ship all cold storage products with an ice pack and cooler bag, irrespective of order quantity. An automatic $3.00 charge will be added to the shopping cart, unless the order contains three or more cold products.